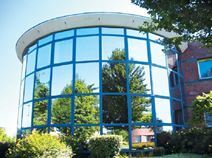 Strategically located just moments from the centre of Lille by the Villeneuve d'Ascq this newly renovated business centre is surrounded by luscious views and provides beautiful views from bright and spacious offices and two on-site meeting rooms. Amenities include two onsite meeting rooms, secure and unlimited internet connection and WiFi throughout the space, private and secure parking with spaces for your visitors and guests as well as multilingual staff that offer secretarial services. Brand new work-space available with flexible terms in the centre of Villeneuve d’Ascq. The building is based within a recently developed business park and benefits from on-site parking, disabled access and bike storage. The centre is within easy reach of a large retail park with both fast food and higher end restaurants and there is lots to do in around the city such as visiting museums and art galleries. There is excellent transport links with The Les Prés subway station just across the road, with connections into the centre of Villeneuve d’Ascq and Lille. Some of the other amenities include a communal kitchen with tea and coffee making faciltiies and an on-site management team who will take care of everything from receptions duties to the building maintenance.